Sometimes an artist looks at a white canvas with despair... what to do? 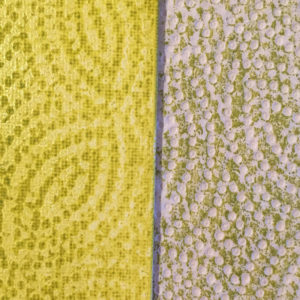 An easy way to jump start creativity is to start with some textural patterns on your substrate. You don’t have to fill your canvas, be selective if you want. Get out a neutral color paint, such as a pale grey or blue. If you are using a craft paint, mix with a bit of water. Try for a consistency that is a bit more fluid than cream, but not as runny as milk. If you use Golden Fluids, simply apply your selected color to the canvas. 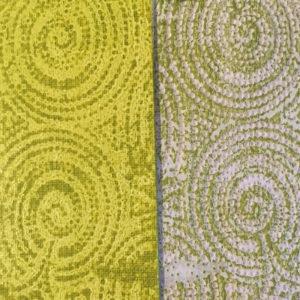 After you apply paint to your canvas (doesn’t have to be "perfect"), place a piece of paper towel that has an embossed pattern on it. Rub gently. Pull off the paper towel. You can also use this trick to enhance part of a painting that is in progress. Helpful hint: Use inexpensive Styrofoam plates for your palette. If you have to stop painting and paint is wet, place in a plastic bag and seal. The paint will stay wet for days.